Are you looking for more winter items to forage for free and satisfying food? Foraging for wild food is fun and satisfies a primal gathering, human need. Pine needles no longer need to be a hassle in the wintertime. They fall and coat walkways, leaving a slippery mess. 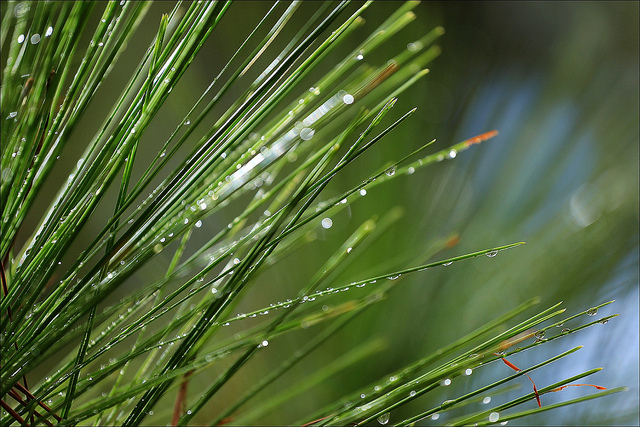 Harvest some of the pine needles and make them into a delicious and earthy pine needle vinegar. Collect green pine needles from pine trees before the needles fall. Wash well and pat dry. Only eat the green needles and remove the sticks and branches. A large glass mason-type jar with a rubber gasket and closing lid. A few handfuls of pine needles, about a cup or so. Wash and dry the pine needles. Boil the apple cider vinegar until bubble and let it cool to room temperature. Place the pine needles and the cooled vinegar in the mason jar. Close it and leave it in a warm dry place for 1-2 months. Strain the pine needles out of the vinegar and keep it in a jar in the fridge. Don’t leave the pine needles in once you use it or else it will continue to steep and get too strong. This pine needle vinegar is intensely flavored, so a little bit goes a long way. This is a great alternative to balsamic or regular vinegar when added to salad dressings or thick sauces. It will add an amazing scent and flavor to roasted fish. Those who love piney and earthy flavors (think gin) will love this!